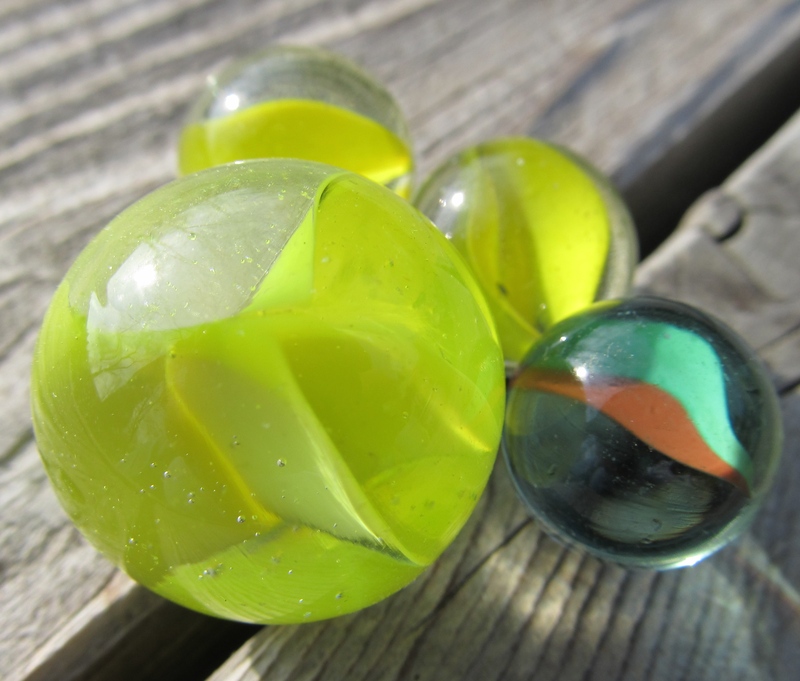 There was a time when a young boy’s wealth was measured in marbles. 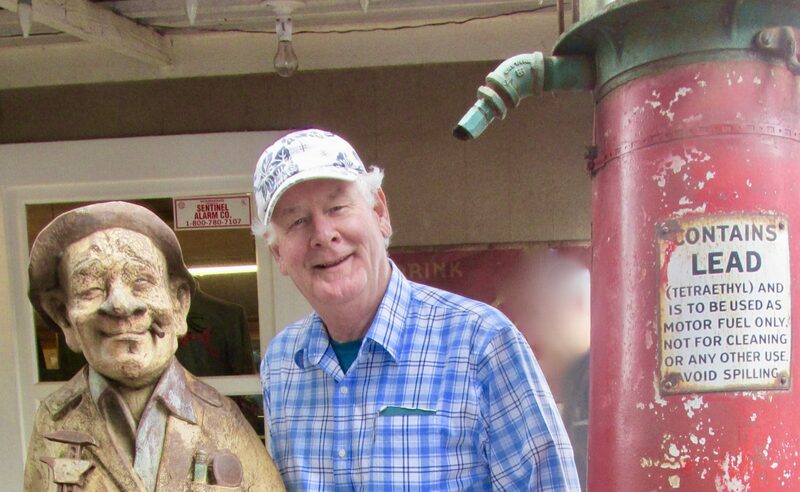 In my hometown, Delhi, Ontario, any 8- to 10-year-old was appointed rank according to how low his pants sagged after a lucky run at the alley pots in our school yard. 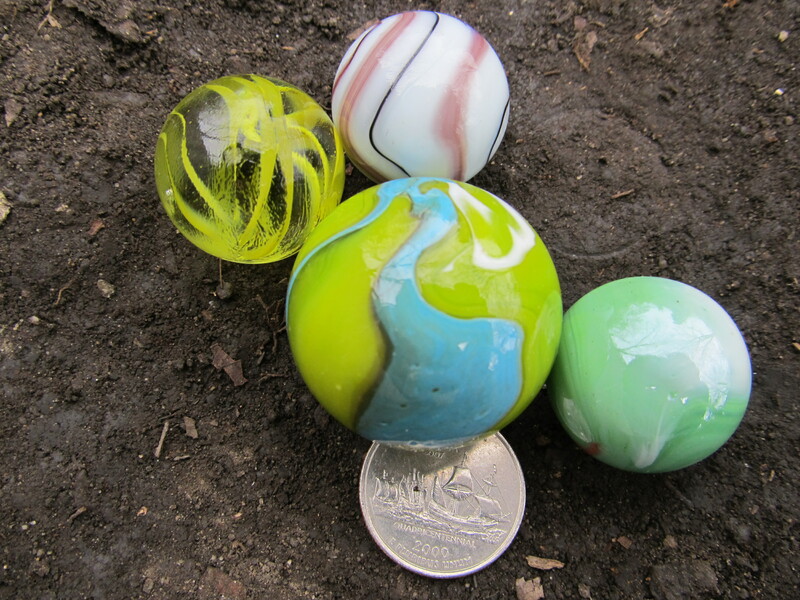 We called these beautiful pieces of glass “allies”, and we played on a hard-packed stretch of topsoil just east of the bike racks under a young oak tree. Alley season started in late April, as soon as the ground dried up from winter, and lasted until school adjourned, end of June. The alley “pots” peppered a 50-foot square of packed dirt, which looked like a miniature minefield pocked with tiny craters, and not one blade of grass in sight. The dirt patch was as noisy and busy as any Vegas casino, with players hustling any comer when a pot freed up for a game. Pint-sized spectators crowded the action like gamblers around a craps table. The pot was a significant diversion from tradition. 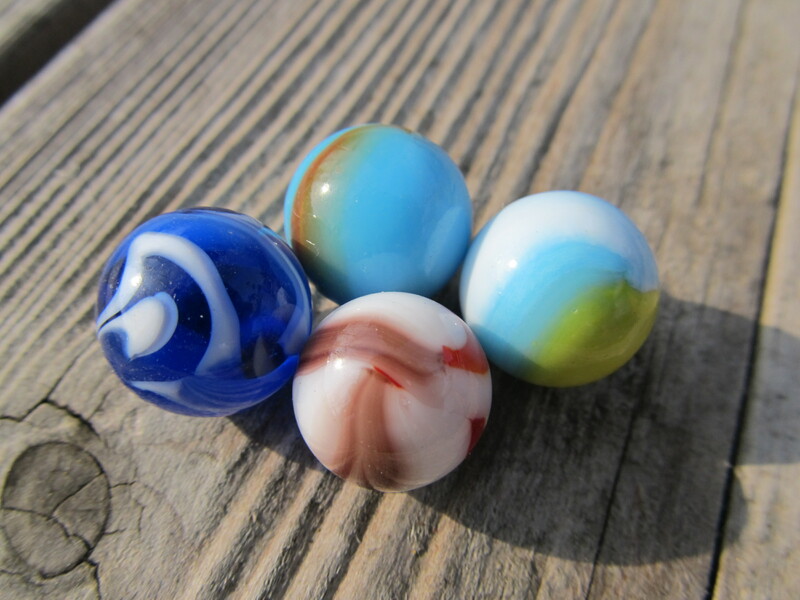 Generally people describe “marbles” as a ring drawn in the dirt or pavement, and a bunch of marbles inside the ring. Two players would flick marbles at the inner circle, claiming any they knocked out of the ring. Like dodgeball. Our game was a more like golf. The pot was dug into the dirt. Kids would rotate about ten times on their heel, and form a 4-inch- deep pot that measured about 6 inches across. Do NOT try this at the golf course. 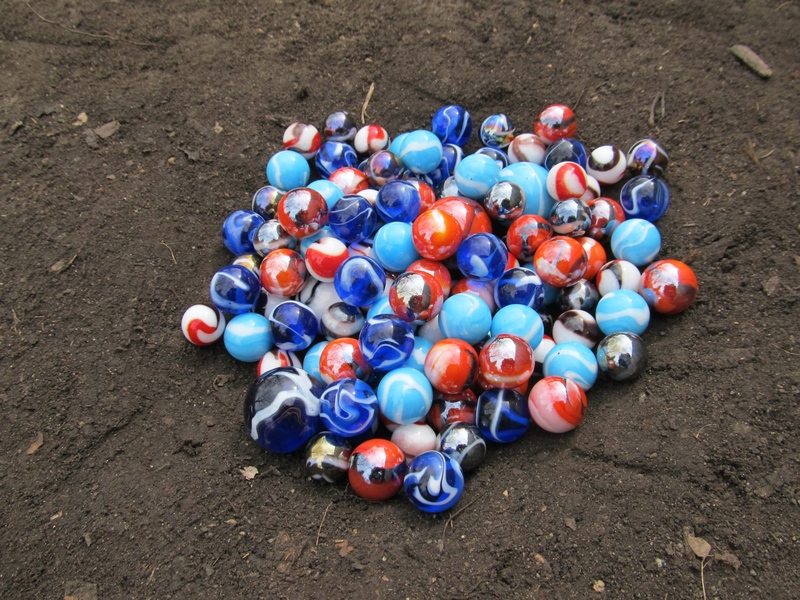 The pot was the target, and also held the stakes–a heap of 10, 20, 40, maybe a 100 marbles. Each player would keep one marble out for play. Stepping about ten feet back from the pot, they dropped their marble, and would alternately inch the marbles towards the pot, usually with their foot. Big stakes for the winner of the pot. The moment of truth occurred when a player felt they could sink one of the marbles into the pot. Crouching down on one knee, they pushed the marble with a curled forefinger. Much like golf putting without the fancy shoes. Or billiards, with no cue. Or like curling, without the 40-pound rock. That decisive shot may have been 5 feet away, or perhaps only 12 inches, depending upon the smoothness of the path, the break, and the depth, width and contents of the pot. If the marble dropped, the player had another turn with the remaining marble. He might inch that one along, or, take the long shot. If it sank, he won the pot. If he missed, then the next turn went back to the other player, who probably would sink it. With that, fortunes were won and lost every minute with a chorus of cheers and groans around the alley pots. A “starry boulder” with three small friends. And fortunes they were. The Chainway sold “starries”, 30 for a dime. 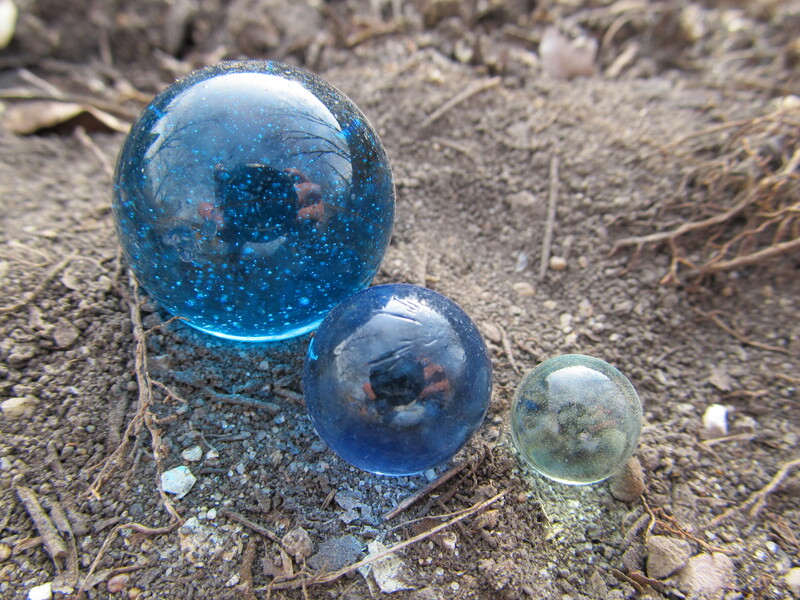 The starry was a half inch in diameter, and had a twirly colored pigment frozen into the center of the marble. If you had the money, you might pick up a bag of starry “boulders”. These were nearly an inch in diameter and went 6 for a quarter. Pricey, but in the school yard, they traded around 10:1 against the smaller marble so there was room for arbitrage among the quicker thinking players in the yard. 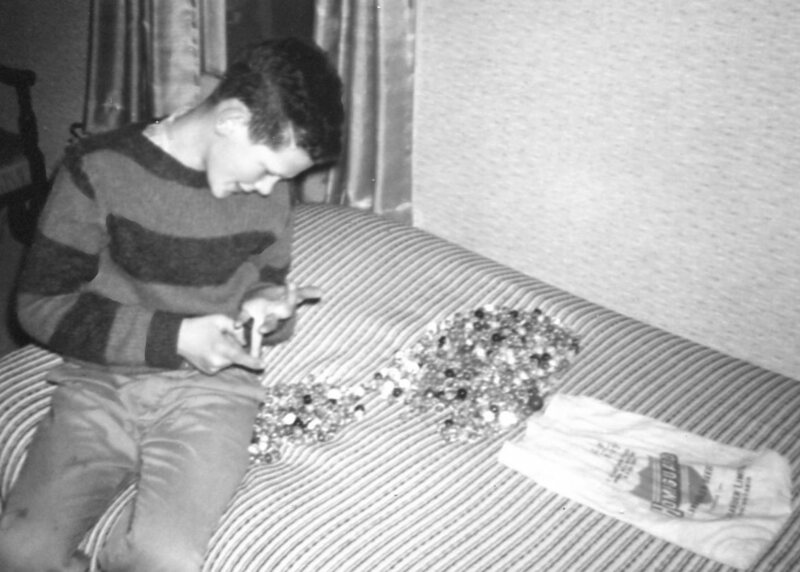 Possessing a fortune in marbles was risky, too. According to their job description, grade school teachers are hired to confiscate marbles. In class, the sound of a vagrant marble clattering among the chair legs on a hardwood floor felt like money falling down a grate. “Aggies” were the antiques of marbles. Logging the misdemeanor, the teacher would demand the marble be retrieved and placed in a mason jar on the corner of their desk. You could buy them back, 3 for a penny, proceeds to the Red Cross. This was a tension-filled time for big winners, whose loaded pockets would bulge like mumps. Gingerly sitting down with the grace of a hemmorhoidal sufferer, the trick was to keep the pockets vertical to the fall line, and packed tight. Kids with zippered cargo pants could plop, heavily laden, into their chair with impunity, but if they didn’t wear belts, they ran the risk of mooning the class which was a major felony. A super boulder aggie, bigger than a quarter. Of all my childhood past times, allies made the deepest imprint. In 5th and 6th grade, I played with stakes from one to twenty marbles, and had won pots as high as 400. But I have lost 400 too, which twisted the sharp blade of experience, let me tell you. 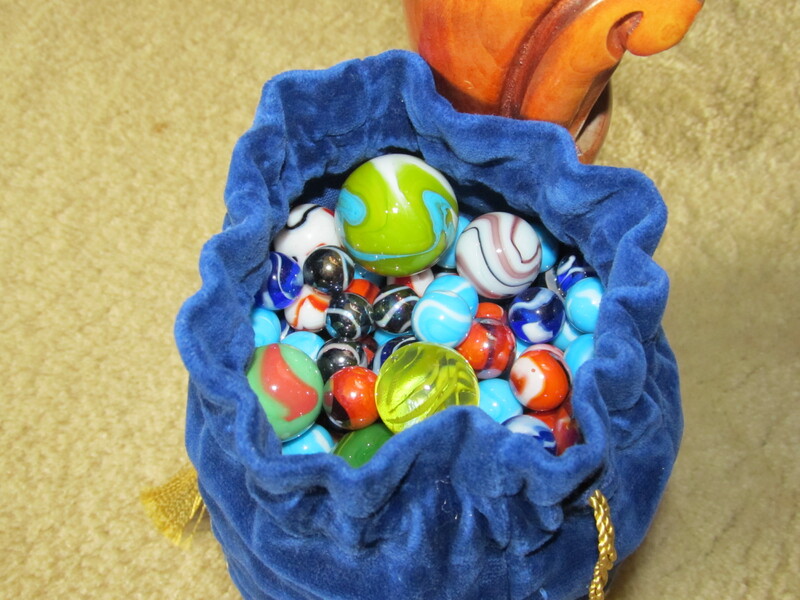 So much so, that I cannot pass a marble display in a toy store today without picking up a bag or two. Now, a marble costs about 10-cents each, a 3,000 % inflationary effect. Do you know some popular brands of liquor use small marbles in the bottle neck to slow the flow? I cut them out when the bottle’s empty. So far, I am not buying liquor just to retrieve the marble. My wife shakes her head, staring at me– a sorry junkie who can’t kick the habit. A “purie” boulder and marble. Johnny Walker Double Black provided the tiny one. 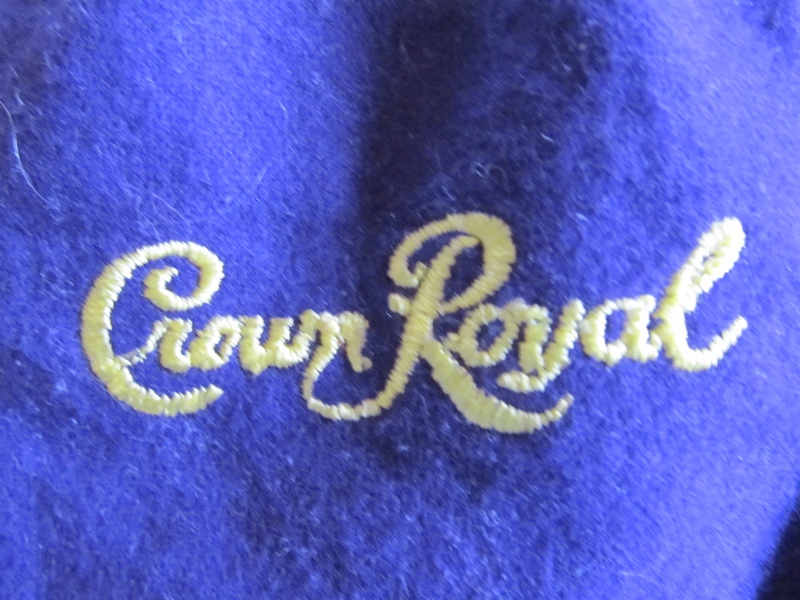 I am not sure what to do with my stash: two large Crown Royal bags. While I want to give them to my grand kids, I have this shameful, miserly greed that won’t let them go. Remember in “Ghost” when Whoopy Goldberg won’t let go of the $4,000,000 check? It’s like that. I am afraid they’ll end up at the bottom of a fish tank. Or worse, inside a flower pot anchoring a bunch of tulips. It would be okay if they were displayed in a glass table, maybe. The alley bag of choice. But what I wouldn’t give to take the whole lot of them to a school yard next week and find a buzzing, hard-packed dirt casino, under the shade of an oak, churning with the yell of young risk takers, digging holes for a new game. Thanks for sticking with me as I try to control this habit of mine. I just can’t shake it. If you “like”, say so, and please share or follow! At the end of a long successful day.